Many complex energy systems use thermodynamic process simulators for systems design, especially if fueled by oil, natural gas, methanol, hydrogen or landfill gas. The leading industry simulators are Aspen Hysys, ProSim, and VMGSim. These simulators are very powerful, as they can model very complex chemical and biological reactions, networks of unit operations with many interactions requiring multivariable convergence, and both steady-state and dynamic control systems. As they provide significant value, especially to Oil and Gas, the license fees per seat are on the order of $10,000/year. Open Source software continues to gain traction with consumers; for example OpenOffice has approximately between 10-20% of the market, with Microsoft Office being most of the rest. Could there be a viable Open Source alternative for thermodynamic process simulators, given the smaller market and similar software complexity? 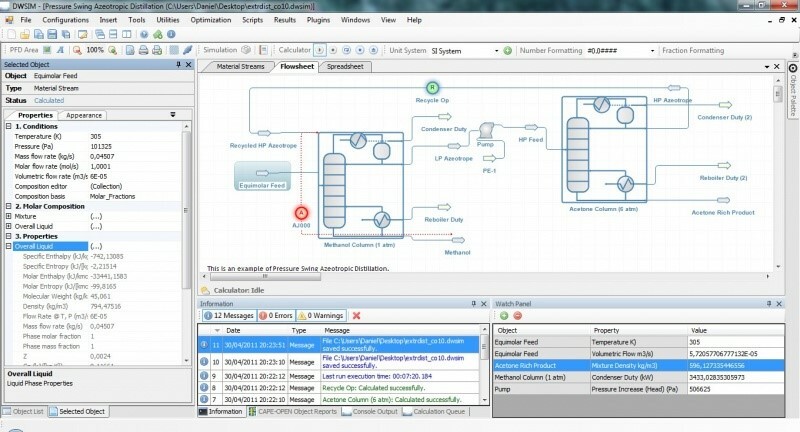 DWSIM is the only real Open Source thermodynamic simulator with a very similar capability to the steady-state versions of Hysys, ProSim or VMGSim, including a graphical flowsheet and integrated spreadsheet. I have recently used both the latest versions of a leading industry thermodynamic process simulator and DWSIM. I am impressed with DWSIM, and I am currently productive with this tool. It has the core functionality for steady-state mass and energy balances, and is powerful enough to examine part power and start-up states. It is easy to use, easy to report, and convergence times are good. While it does not have dynamic capability, nor is that capability on the author’s roadmap, the vast majority of studies for most users are done in steady-state mode. The overall support materials are good. One advantage of being open source is that the underlying engine and calculations can be more transparent to the user, so for some that can be good for learning and checking. Every process simulator has its own learning curve because they all have somewhat different convergence routines and architecture, and especially for converging very complex networks, so to become truly productive will require some time investment. I have simulated high complexity systems in DWSIM so far, and overall it works fine. The author, Daniel Medeiros, is currently active and planning further releases, which means the product will continue to improve. For many users, such as students, or some small businesses, part-time practitioners, or those that need primarily the core functionality only, DWSIM is a great choice. So far the big industry players with proprietary software do not offer light versions of their software for lower costs, so there is a demand for packages like DWSIM for this end of the market. DWSIM has the “first-mover” Open Source advantage, and can set the standard in this segment of the market, and will take some of this market from the big players. Overall, I am pleased with the product for what it is. For most large companies, the industry leading simulators are an overall better value proposition, because of the higher power and features. For the other end of the market, DWSIM is well worth trying, or may be the only economic option. This entry was posted in Simulators, Thermodynamic and tagged review, simulator, Systems Engineering, Thermodynamic by Craig Louie. Bookmark the permalink.